RISE595 and RISE596 are samples from present-day Montenegro dated to the Late Bronze Age and Iron Age, respectively. I haven't been able to dig up a lot of information about their archaeological contexts, but both are from Kurgan-like Tumuli burials. If their PCA placements are correct, then I'd say they more or less resemble the samples from Bronze Age Hungary (marked on the plot as Hungary_BA). What this suggests is that their DNA, like their burial style, is in large part of steppe origin. RISE598 is a Late Bronze Age sample from a bog burial near the present-day Lithuanian/Polish border. This individual clusters close to Unetice samples from the Czech Republic, Germany and Poland, as well as present-day Poles, which, at least to me, makes good sense. Very interesting work, thanks for doing this! RISE598 is from southwestern Lithuania. If he had lived in the Middle Ages, he would have been found in the north-central part of the Sudovian (aka Yotvingian) territory. But of course there's no reason why this tribe should have existed already in the LBA, moreover at the same place. Indeed RISE598's position in the PCA makes this rather unlikely. It should be noted that although he's LBA, the absolute dates make him contemporaneous with the early Iron Age in central Europe, he lived between c. 900 and 500 BC. It's striking how he differs from modern Balts. But this is in line with the evidence for the craniometric evolution in the Baltic: The Bronze Age introduced a new type to this area that differed from the Baltic Corded type. It brought about a massive, but narrow faced type with clear southern affinity (southern in the sense of south of the Baltic, not from the Mediterranean). 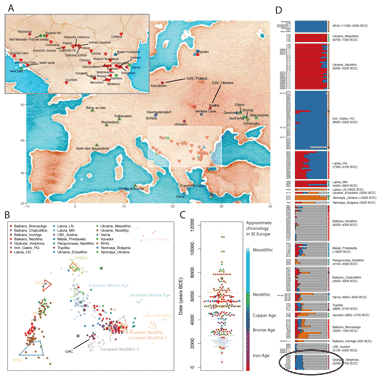 And there we have the proof from ancient DNA that these Bronze Age Balts indeed had a southern affinity, to LNBA central Europe. The Sudovians were craniometrically quite different and maybe migrated in from the east at a later date; they had some similarity with the Fatyanovo type. The western Balts, including the Old Prussians, were predominantly of the Bronze Age type. The Montenegrin samples are no less fascinating and amazing. 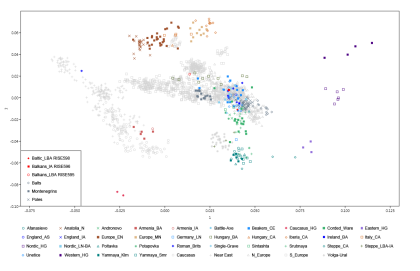 The LBA sample seems still close to modern Iberians. Certainly not because of Iberian admixture, as some have believed, but because of Sardinian-like basis with some mild LNBA/steppe admixture. The Iron Age sample in contrast looks rather northern, like LNBA central Europe. That's evidence for migrations from the north towards Montenegro - perhaps associated with the arrival of the Illyrians. It's amazing how both differ from modern Montenegrins. The latter are clearly on the cline towards the Levant that also affected Italy and Greece! Yeah the Iron Age one is very northern ! Were you able to do anything with the Iron Age 'Cimmerian' from Gamba ? And could you plug these above samples in your CHG K8? I can't run RISE595, RISE596 and RISE598 in any of my ADMIXTURE tests. They don't have enough data. And how about RISE471? A BA burial from southern Germany, judging from Fig. 1 MBA, that would be Tumulus culture. Seems to be in the French range, as I had expected because of his Dodecad results. Quite southern actually. This may give a hint as to what the Gaulish Celts were like - French like. Some Celtic north-south migrations in the Iron age may have changed the picture somewhat, though. Hmmm, must not be exactly FRENCHlike. Its only a single one. He is amoung the long North-South line of the BA Hungarians. there could have been a similiar line for southern Germany. the bronze age Balkan person is also in that area. Not really in the North French range. Of course it's just his position on a plot of the first two principal components of West Eurasia that clusters with the French, so at least in these two dimensions he's French-like. But the higher dimensions we don't know. That's also a reason why it doesn't make sense to ascribe the Iberian-like position of the Bronze Age Montenegrin to direct Iberian admixture – we don't know if he was THAT Iberian-like. But at least RISE471's Dodecad results are in line with a French-like composition. Agreed, there may have been wide variation like in the Vatya culture of Bronze Age Hungary. Some of them are also clustering with the French in the PCA. The Bronze Age Montenegrin is close to them, but immediately adjacent to the modern Iberians. RISE598 is interpreted as R-Z92 here https://genetiker.wordpress.com/2018/01/31/y-snp-calls-from-ancient-northern-europe/ Not figuring how they got valid SNP calls.